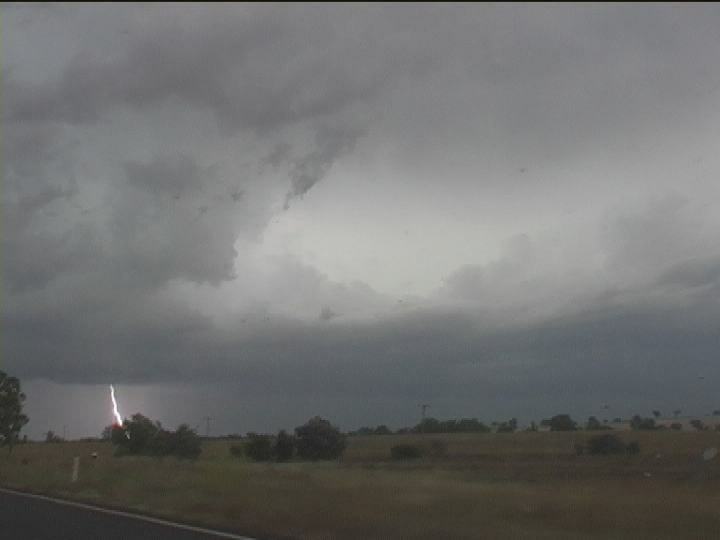 This day was definitely teasing for severe weather and a chase was in order. With moisture return into an unstable atmosphere, a high CAPE environment existed with decent wind shear. Short lived severe storms and squall lines were likely along and ahead of the trough. Eventually the atmosphere would become saturated with countless storms embedded in a complex. A good moisture profile existed in the meanwhile; our target just east of Coonabarabran. Low bases were a certainty as well. My chase partner on this trip was Geoff Thurtell. Heading up the Putty Road brought back memories of early chases. You see, heading up the Putty into the Hunter introduced that anticipation to the chase as cells could be observed in the distance through the clearing of the early rain. This was no exception with anvils already existent to our northwest and west. 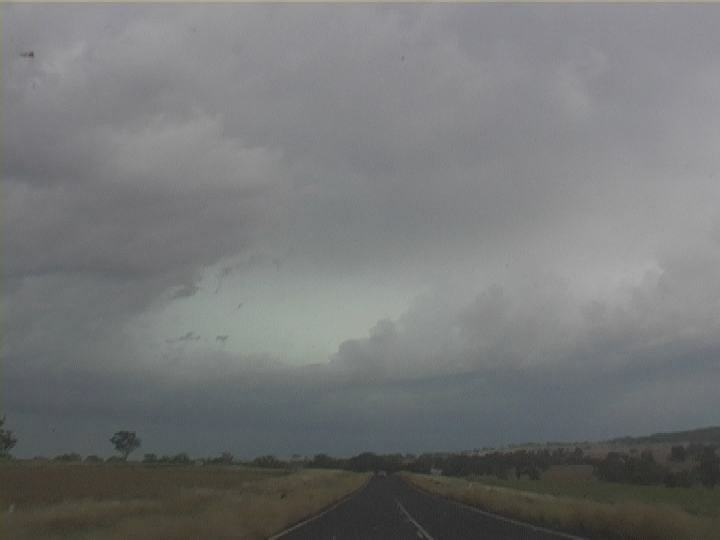 Continuing past Muswellbrook and over the range at Murrurundi, we had quickly approached the storms near Quirindi. Finally parked at an elevated position along the New England Highway , Geoff and I enjoyed some of the early activity despite the storm being clearly outflow dominant. But it was interesting as the storm increased in electrical activity with some pulsing bolts for a period of about 15 minutes. 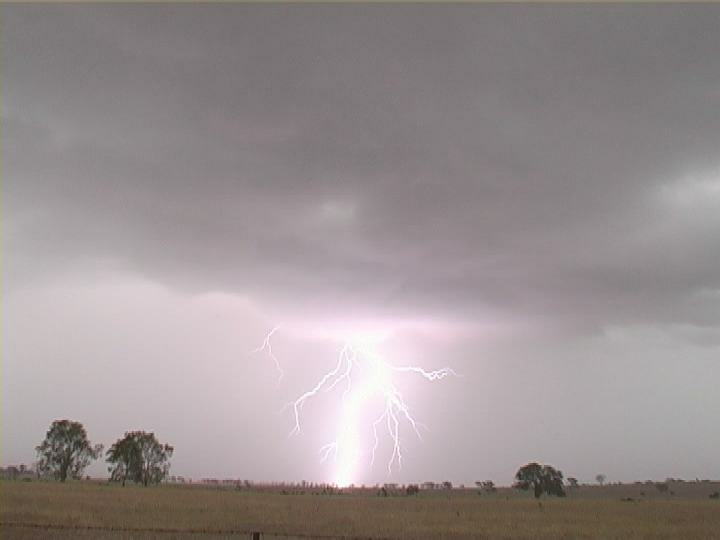 With the rain imminent our next destination was our original target Coonabarabran. 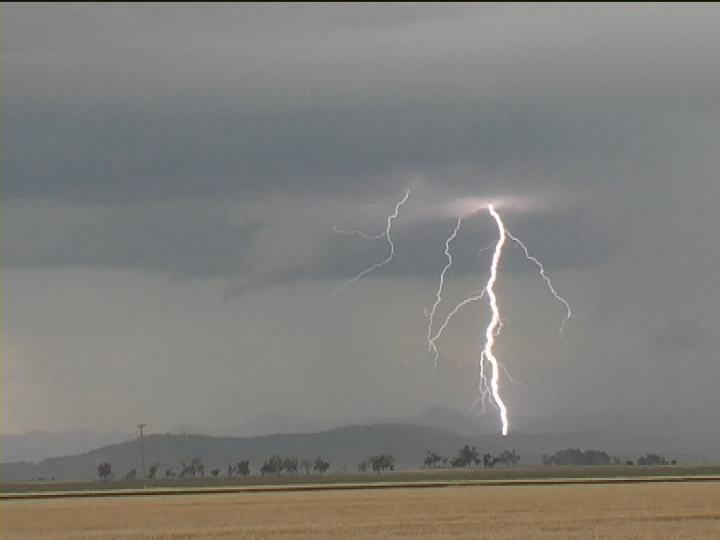 Another storm impressive rain free base greeted us just to the west of Quirindi ­ more time-lapse opportunities. 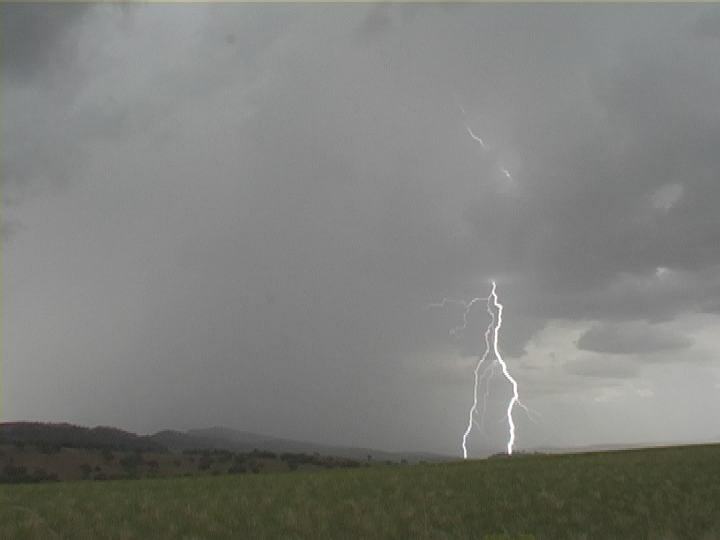 Some erratic lightning activity introduced some nervous and uncomfortable moments here. This storm clearly was multicellular and we allowed it to drift further southeast. After lunch, we explored the storms with tempting updrafts to the south. The outflow dominant severe storms blended in with the golden, open plains. Lightning to the southeast and east along the rain-free base and gust front region indicated the storms had punched further in height tapping the increased energy source. Matt Piper and Jeff Brislane were at this time enjoying a feast of activity further east ahead of these storms. 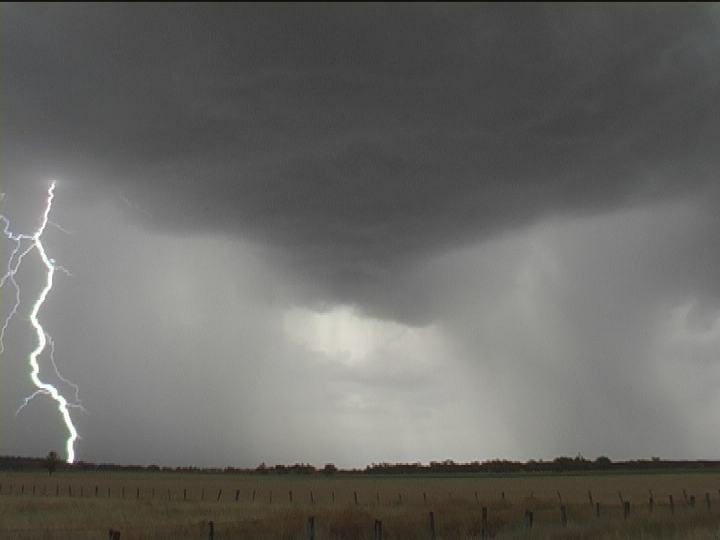 Our attention turned to a severe storm almost unnoticed in the direction of Coonabarabran to our west; the side anvil a clue to its discrete nature and severity. No time wasted, we headed west through Premer ­ decision time. Do we head north or west north west up close and personal? We took the risk and headed west. The storm structure was soon revealed and frequent bolts ripped through the green, architectural structure. This is what we came to see and in perfect timing too. This storm exhibited high energy during this barrage. There was only one problem; we got to see this barrage of lightning through the trees. By the time we were up close and personal, the storm's outflow had begun to dominate and the storm looked far less impressive. Had we remained further back, we would have from just a little distance observed and filmed the whole event. I guess in hindsight it was easier to reflect on but as one would have anticipated on this day, storms were not expected to be long lived. 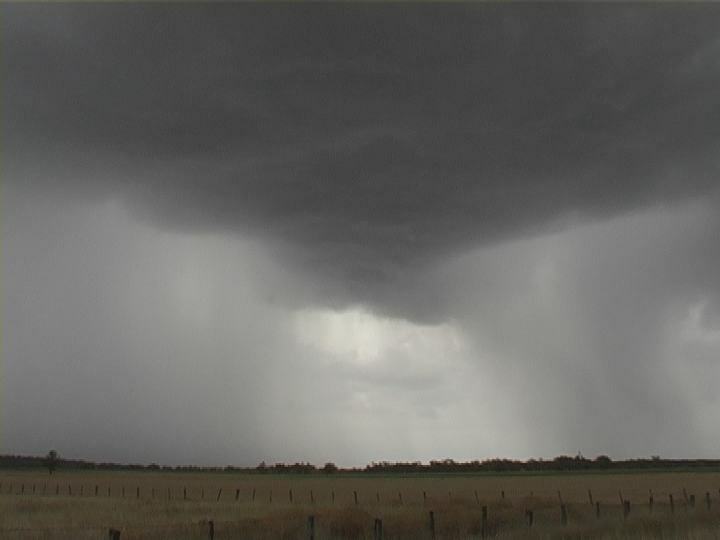 The storm was practically dead as we roamed back east, then north and west towards Coonabarabran ­ the broken branches and stripped leave evidence of strong winds and likely large hail from the storm at its peak. 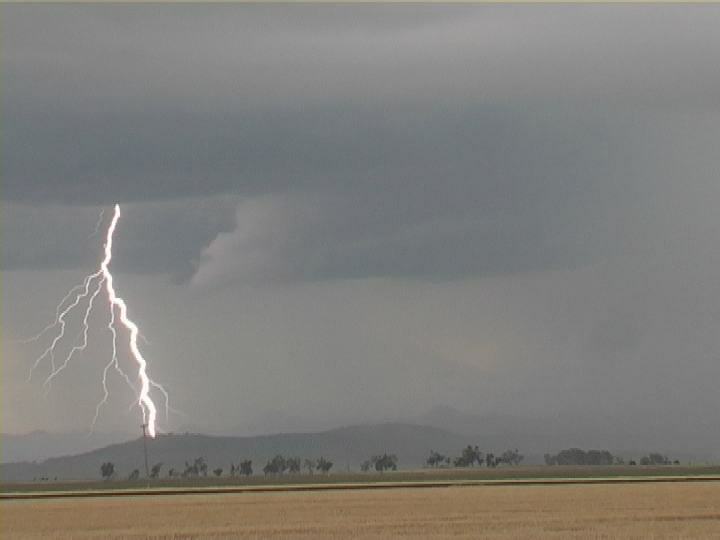 Locals also commented on this severe storm mainly east of Coonabarabran. Our chase was over for the day. 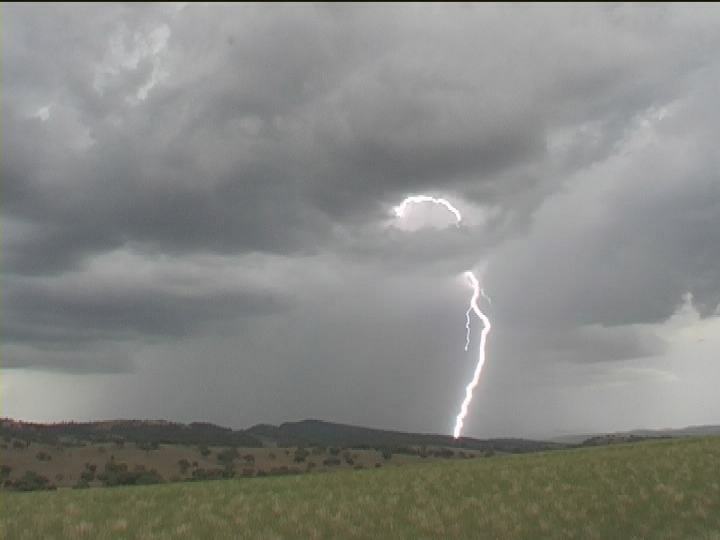 Remaining overnight at Coonabarabran teamed up with Matt Piper and Jeff Brislane, we decided to chase yet another day of likely severe weather. Wind shear was decreasing though high CAPE was anticipated. Lack of surface forcing was a problem ­ in fact this was the problem on the day. The dry air from the west intruded aloft mixing with the moist surface air. From high vantage points we watched as storms developed further north becoming widespread but too far for our liking considering we had to head home later. Weak storms had developed just to the west so just south of town we waited patiently ­ time the ruling factor; distant darkening skies not sufficient encouragement for Geoff and I to wait any longer. Jeff and Matt lagged generally in hope for a lightning show. Their patience paid off with a small storm developing producing lightning with a setting sun producing a red glow on the golden landscape.